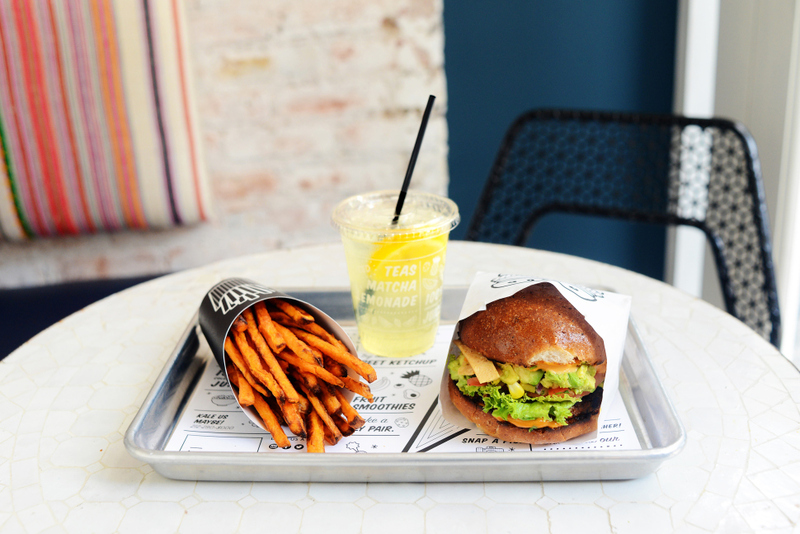 Veggie Burger Spotlight – The Guac Burger From NYC Restaurant by CHLOE. I love veggie burgers and have eaten a lot of them, so I wanted to start sharing my finds with a new Veggie Burger Spotlight series. So many veggie burgers, so little time. 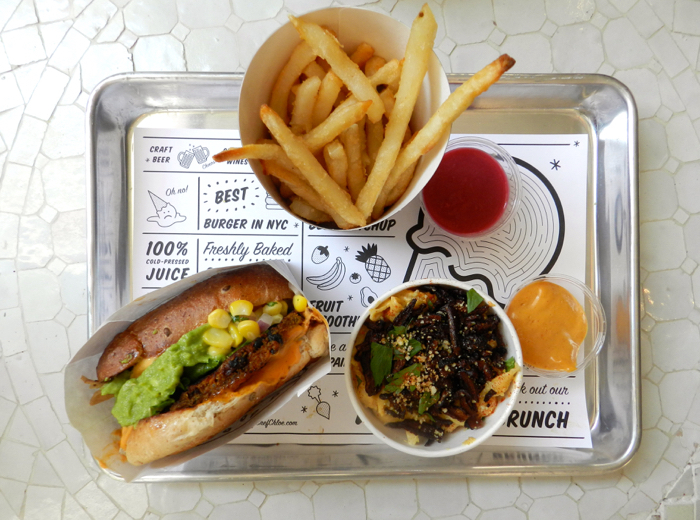 My first Veggie Burger Spotlight pick is the Guac Burger from NYC restaurant by CHLOE. I’ve been raving about CHLOE a lot lately and went there for the first time this month. Overall, the food is awesome! The restaurant opened in NYC about one month ago and has already become a popular spot. One of their best-selling menu items is the Guac Burger. It’s a black bean-quinoa-sweet potato patty with corn salsa, onion, guacamole, tortilla strips, and chipotle aioli on a whole grain bun. YUM. This burger is seriously delicious. The tortilla strips give it a nice crunch, and the chipotle aioli is balanced out by the cool guacamole. The varying textures (crispy from tortilla strips, creamy from guac, soft and chewy from corn) all come together to make one amazing burger. Don’t forget the sweet potato fries! Though I could definitely eat the burger on its own and feel satisfied for lunch, the fries were a nice complement to the meal. They come with beet ketchup and chipotle aioli, as well, and both were delicious. What veggie burger are you loving lately? Check out my other Veggie Burger Spotlight posts. You are so lucky you got to go here! I want to go so bad but I’m 3 hours away : ( I’m definitely going to make the trip someday though! This guac burger looks totally up my alley, yum!!! This burger is definitely worth taking a trip for! It’s delicious. The place is adorable inside, too! This place is fabulous, isn’t it?! 🙂 I can’t wait to go back and try more yummies from Chloe. How was the beet ketchup? So wonderful! And well-priced compared to other vegan food in the city. The beet ketchup was yummy, but I just like tomato ketchup better and wish they had it as well haha. my favorite is the lentil burger from active culture in San Clemente or the house burger from manna in Maui. Both are outstanding!